Last season's champion 2yo Pierro made a winning seasonal debut in Saturday's Group 3 The Run To The Rose at Rosehill Gardens to keep his unbeaten record intact however even a $1 million carrot in the Group 1 Golden Rose on the same track in a fortnight will not tempt trainer Gai Waterhouse from deviating from a plan to send the colt straight to Melbourne. The victory sent Pierro's earning to over $3 million from seven starts without a flaw. "You've just seen an outstanding, outstanding colt," Waterhouse enthused. "He's Australasia's best colt by so far it's not funny." "Today was his biggest test because I had a slightly lesser time to get him ready and I thought I'm not going to start him until I get him ready –absolutely wiped the floor with them." Waterhouse indicated that the 3yo son of Lonhro would be sent to Melbourne with the stable will be represented in the Golden Rose by the Haradasun gelding Kabayan who finished second to the outsider Lady Of Harrods (Dubawi) in Saturday's Group 3 McNeil Stakes at Caufield. 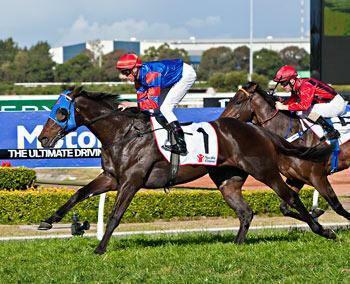 "We've got a couple of weeks up our sleeve and you'll see him (Pierro) in the Bill Stutt [Stakes] at Moonee Valley [on September 28]." Carrying 60 kgs with his Group 1 penalties, Pierro gave weight to the entire field and left none with an excuse. Winning jockey Nash Rawiller said the Lonhro colrt was a class above "Once we parked outside Ashokan it felt like game over in the run he just ambled up to them. I think he's a more professional horse than what he was last year. The world's his oyster because he's such a freakish colt." It was just 11 months ago when Pierro narrowly won the Listed Breeders' Plate at Royal Randwick after which Gai Waterhouse confidently predicted that we had ' just seen the Golden Slipper winner'. The son of Lonhro would go on to win the world's richest prize for two-year-olds but he did not stop there. A week after landing the Slipper he lowered the boom on Black Caviar's previously undefeated half-brother All Too Hard (Casino Prince) in the ATC Sires' Produce Stakes (1400m) . Fourteen days later he completed the mission by defeating Dear Demi (Dehere) in the Champagne Stakes (1600m). It took his earnings to just short of a stratospheric $3 million dollars from six undefeated starts. Pierro carries the Darley brand. He was pinhooked as a weanling for $115,000 before being offered at the 2011 Magic Millions yearling sale where trainer Gai Waterhouse signed the ticket for $230,000 on behalf of owners Greg and Donna Kolivos.